And that someone was quarterback Brock Osweiler. In just about every vocation on the planet, an employer would spend ample time meeting with a prospective employee before deciding to fork over a multi-million-dollar paycheck. Not in the NFL. In the NFL, you can have a situation that unfolded like the one in Houston, where the Texans, as Peter King of TheMMQB.com pointed out Tuesday, met Brock Osweiler for all of 10 seconds before they agreed to give him $37 million guaranteed. King spoke to Texans coach Bill O'Brien, who highlighted an issue the NFL has with free agency right now: teams can't talk to players who are under contract and set to be released until the actual start of free agency. The legal tampering period effectively created a 48-hour buffer window where teams can negotiate contracts with agents but not actually meet potential hires. 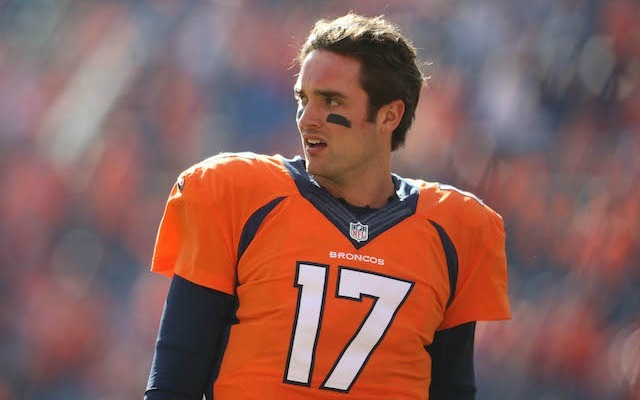 For Osweiler, that didn't happen because of how the succession plan in Denver -- he was waiting on Peyton Manning to retire -- was unfolding after the Broncos win in Super Bowl 50. So how much time did O'Brien spend with Osweiler before signing him in total? Roughly 10 seconds. It's true, and O'Brien mentioned it in his press conference. Asked how he pitched Osweiler on coming to Houston, well, he didn't. “There was no pitch. [GM] Rick [Smith] deals with Jimmy Sexton, his agent. First time I met Brock was when he showed up on that day when we had a press conference. He’s a good guy," O'Brien said. "I know there’s a lot of people that have coached him throughout the years that I personally know, so I’m sure he spoke to those guys. We spoke to those guys. "That was one thing that stood out to me about him was everyone we spoke to that was either a coach or a teammate couldn’t say enough good things about this guy." The Texans gave Osweiler a four-year, $72 million contract with $37 million guaranteed based on watching a lot of film and on the word of a bunch of mutual friends. This folds into the issues former Seahawks tackle Russell Okung faced while representing himself in free agency. Okung couldn't visit with other teams because the legal tampering window only allows agents to visit. Not players. Osweiler was also dealing with the issue of avoiding the Broncos. At Sexton's request, he'd gone dark so teammates and coaches couldn't make an emotional pitch to keep him around Denver. It made visiting difficult. Good luck sneaking into Houston. Especially when you're 6-foot-8 or whatever height Osweiler claims. However the process shook out, he's just starting to learn about the Texans even though they already gave him $37 million guaranteed. Talk about a glitch in the system.